I am totally and absolutely addicted to iced tea. Luzianne decaf, for preference, but really I'll take anything. It used to make it a real hassle to travel, since in many parts of the United States, until recently, iced tea was definitely a seasonal drink, and could only be got in spring and summer. But with the Starbucking of America, I can now get a venti black iced tea, no-sweetener, no-water (with two Splenda added in at the bar) just about everywhere, so I can make do. I'm always in the process of filling-in holes in my education. Just this spring I discovered that I'd never read any Diana Wynne Jones, having had the mistaken impression for years that I had. I read a half dozen of her novels in the following weeks, and discovered what I'd been missing. This week I started in on a stack of Andre Norton novels, since I don't think I've ever read one of hers, either (though I started one, years ago, and got distracted before making it more than a few pages in). When that's done I'm going to be reading a couple of Harry Turtledove novels. Of course, what I'd really love to be reading are the new Kage Baker and John Scalzi novels I've got sitting on my To Read pile, but those are rewards I'm saving for after I finish the novel I'm currently writing, and can take a couple of days and just read for pure enjoyment (and when it comes to reading for pure enjoyment, you can't go too far wrong in looking to Baker or Scalzi). I have a really ridiculously regimented process that's developed over the course of a few years. I start any new project by jotting down random notes in a Moleskine notebook, wherever I happen to be-at the grocery store, at a stoplight, at dinner. I'll make little notations when watching interesting documentaries, or when stumbling across an intriguing bit in a nonfiction book. These notes are usually in the form of questions to myself, asking how I might eventually use this random bit of information. All of these little random bits accumulate until eventually an idea takes shape, and then I start noodling on what the shape of the thing may be. Then I get a cheap spiral bound Mead notebook and go sit in a coffee-shop somewhere, drinking glass after glass of iced tea, and scribble like mad, fleshing out what the story is going to be about. If the notes I make in my Moleskines are questions to myself, the scribbles in the Mead notebooks are an ongoing conversation, or sometimes even a debate, as I argue with myself about what the story should be. Then, usually when I've filled at least one or more of the spiral notebooks, I sit down at the computer and type up the best of the scribbles, polishing them as I go, and arranging them in some kind of order. This becomes the basis of my outline. I'll stare at it for a few days, then start making notes in my Moleskine again about what the outline is missing, what I've forgotten. Then I go back and flesh the outline out, tweaking it, shuffling parts, salting in Chekov's guns in early scenes that can then be fired off in later ones. Then back to the Moleskine, then back to the computer. This can take anywhere from a few days to, in rare cases, a few months. When the outline is inally done, I've got a roadmap that tells me all of the important bits of action in the story, what happens when, and where different bits of information need to be revealed. Then, and only then, I sit down and start writing, with the outline open in a separate window to the new document, side-by-side. I delete the outline as it gets converted, scene-by-scene, into story form, until eventually the outline is an empty document and the story is complete. The advantage of this is that I've worked out in advance what the plot mechanics and such are, so never have to worry about what happens next, and can instead focus on the language almost entirely. I know what I'm going to say, and can obsess on *how* I'm going to say it. See, I told you it was ridiculous, didn't I? In no order but alphabetical, and with no judgements offered about their relative merits: Jorge Luis Borges, John Broome, Edgar Rice Burroughs, Kurt Busiek, Jonathan Carroll, Chris Claremont, Arthur Conan Doyle, Philip José Farmer, Neil Gaiman, Anne McCaffrey, Michael Moorcock, Alan Moore, Grant Morrison, Kim Newman, Daniel Pinkwater, Terry Pratchett, James Robinson, Jules Verne, Kurt Vonnegut, H.G. Wells, and Gene Wolfe. I watch cartoons obsessively. For a few years my favorite was Kim Possible, and my phone's ring-tone is still the sound of the protagonist's kimmunicator. For a while a show called O'Grady was the front runner, which is really a genius little show, but they haven't done a new episode in a while, so far as I know. These days I don't even know if I have a current favorite, and I'm on the lookout for one. Currently I'm rewatching all of ReBoot, an episode a day during lunch. I have a three year old daughter, and I know that in a few years our tastes will completely intersect, and I will be the coolest dad in the entire world. And then, a year or two later, she'll turn ten or eleven years old and outgrow me, and it'll all be over. But for the moment I like having the excuse of a little kid in the house to explain why I spend so much time watching children's animation. 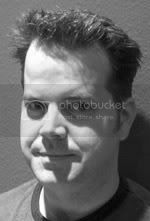 Chris Roberson's short fiction can be found in the anthologies Live Without a Net (Roc, 2003), The Many Faces of Van Helsing (Ace, 2004), Tales of the Shadowmen, Vols. 1 and 2 (Black Coat Press, 2005 & 2006), FutureShocks (Roc, 2006), and Forbidden Planets (Daw, 2006), and in the pages of Asimov's, Postscripts, and Subterranean Magazine. His novels include Here, There & Everywhere (Pyr, 2005), The Voyage of Night Shining White (PS Publishing, 2006), and Paragaea: A Planetary Romance (Pyr, 2006), and he is the editor of the anthology Adventure Vol. 1 (MonkeyBrain Books, Nov 2005). Roberson has been a finalist for the World Fantasy Award for Short Fiction, the John W. Campbell Award for Best New Writer, and twice for the Sidewise Award for Best Alternate History Short Form (winning in 2004 with his story O One. He was a co-founder of the writers’ collective Clockwork Storybook. In addition to producing monthly material for the collective’s online magazine, Roberson produced four novels under the aegis of their imprint—Voices of Thunder, Cybermancy Incorporated, Set the Seas on Fire, and Any Time At All—which received positive reviews from The Magazine of Fantasy & Science Fiction, Asimov’s Science Fiction, The New York Review of Science Fiction, Infinity Plus and RevolutionSF. In 2003 Roberson and his business partner and spouse Allison Baker launched the independent press MonkeyBrain Books, an independent publishing house specializing in genre fiction and nonfiction genre studies. Releases include the extraordinary talents of Michael Moorcock, Alan Moore, Philip José Farmer, Jeff VanderMeer, Jess Nevins, Kim Newman, Rudy Rucker, Paul Cornell, and more. On February 19, 2004, the couple became the proud parents of a daughter named Georgia Rose Roberson. The family resides in Austin, Texas.